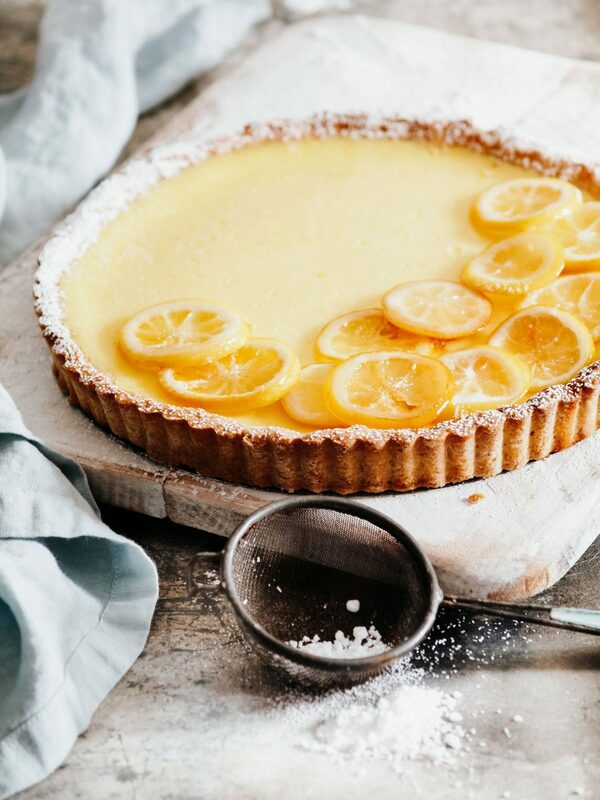 This Luscious Lemon Tart recipe has been in my revolving recipe repertoire for years, 22 years to be exact. I first made it when I worked at the Australian Women’s Weekly test kitchen in the heart of downtown Sydney. There I wrote, tested & styled recipes for cookbooks & magazines. I still make many of the recipes I learnt to make there. I’d cook & taste-test so many recipes in a day, most of them really good, but once in awhile there was a stand-out recipe, like this one. I’ve tweaked it here & there over the years to make my own but it was exceptional from its inception. 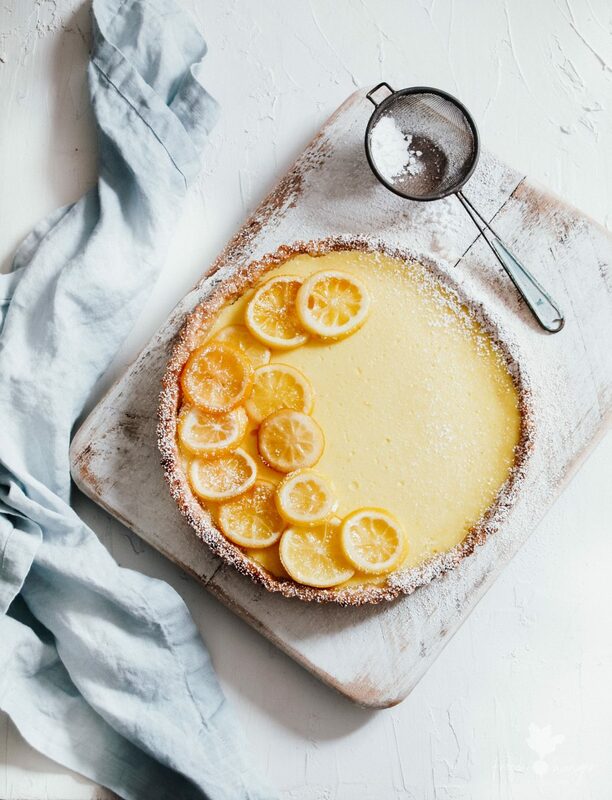 Like me, this lemon tart had its start in a bustling test kitchen, in an old high-rise building, overlooking a beautiful park in a busy city. I’m not one for garnishes, decorations & food that’s showy but if you feel so inclined then the lemon decoration on top really is quite simple. Make it or not, the tart is good either way. SometimesI’ll serve this with fresh berries. Sometimes a nice berry coulis. Often with a dollop of thick, clotted cream or whipped cream. But it needs little to no embellishing. And look, if you’re not a pastry maker have no fear, this pastry is easy to work with & if you follow the recipe correctly, you’ll turn out a brilliant pastry shell. Never let fear & common sense hold you back. 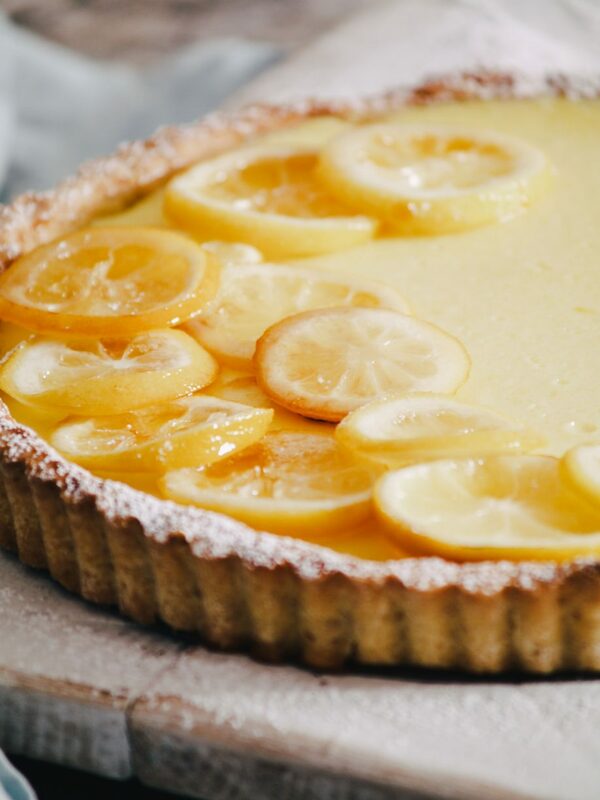 As the name applies, the filling is luscious – creamy, tart & silky, like a really good lemon curd. It’s also very easy to make with all the filling ingredients simply whisked together in a bowl. That’s it. Do you have any recipes that you’ve been making for years that still woo the masses? So many memories are folded through many of the recipes I make. Recipes I return to again & again not only because they’re exceptional & they work but because they’re part of who I am. As I make them I think about other times I’ve cooked them for the different people in my life in the countries I’ve lived. And I will continue to make those recipes, creating new memories from old. The circle of life. To make the pastry, place the flour, powdered sugar, almonds & butter into a food processor; process until the mixture resembles coarse crumbs (do not over process). Or use a pastry cutter. Add the egg yolks & enough cold water to make the pastry just come together (do not over process). Turn the mixture out onto a smooth surface and press into disk-shape. Roll out on a lightly flour surface until the pastry is large enough to fit inside a 10-inch (25cm) tart pan with a removable base. Carefully lift the pastry into the pan. Press into the pan. Try not to have too much excess hanging over. Fold the overhang back over into the pan. Run a rolling pin over the edge of the pan to ensure an even edge. Then go around & gently press the edge of the pastry so it comes up a little above the pan. I do this to allow for shrinkage when it’s blind-baked. Lightly rest a sheet of parchment paper over the top & pop the tart base into the fridge for 1 hour. Preheat oven to 375°F (190°C) Place a sheet of non-stick baking paper on the pastry coming up over the side of the pastry. Half fill with dried beans or uncooked rice. Bake on the bottom rack in the preheated oven for 15 minutes. Carefully remove the paper and the beans. Cook the pastry a further 10 minutes or until golden. Remove from the oven and let cool 10 minutes or so. 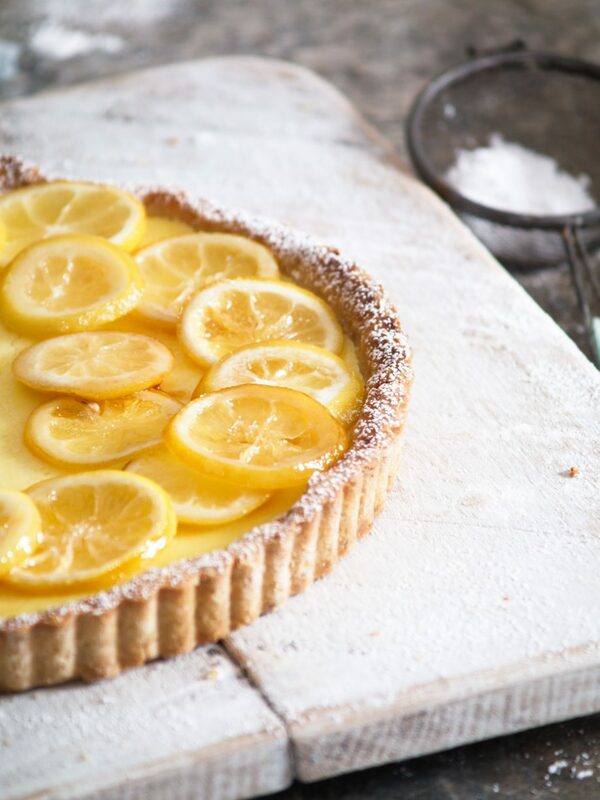 To make the lemon filling, the base is baking & cooling, whisk all the ingredients in a medium bowl until well combined. Allow mix to sit at room temperature for 15 to 20 minutes. Pour the filling into the pastry case. Bake on the bottom rack of the preheated oven for about 25 minutes or until just set. The filling will set more on cooling. Place in the fridge for 6 hours or overnight until cold. Cut into wedges to serve. 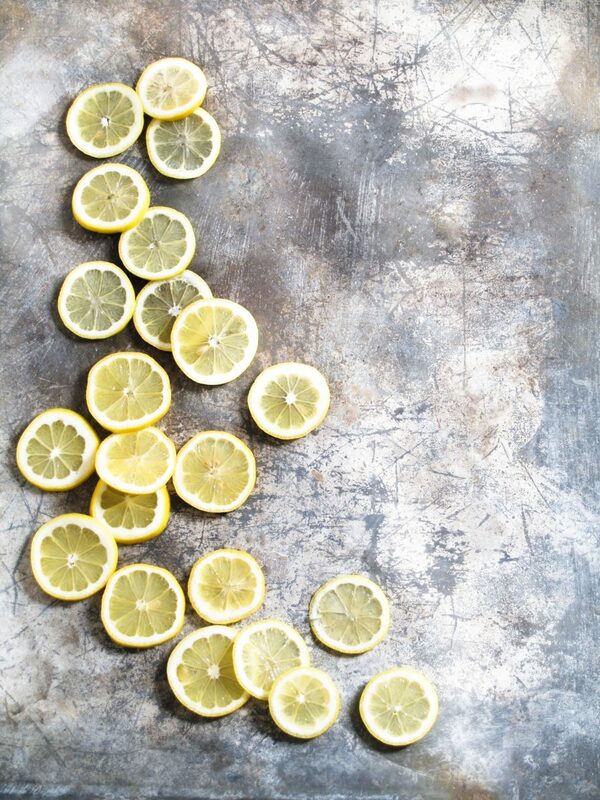 To make the lemon slices, combine sugar & water in a large frying pan over medium-high heat. Stir until the sugar is dissolved. Add the lemon slices in a single layer. Cook, uncovered for 10 to 12 minutes or until slightly candied & translucent. Remove to an oiled plate to let cool. Once cooled, arrange on the top of the cooled tart. The tart can be dusted with powered sugar before serving if desired.